Islamiat with Nazra is a compulsory subject in all campuses. The teaching of Islamiat is not an academic formality in the Academy; rather it is the key subject through which we help the students in sailing their boats in the direction as laid by Allah and His Prophet Hazrat Muhammad (SAW). The curriculum of Islamiat is so encompassed that the students cover almost all the fundamental areas before moving to senior classes. The system feels proud on the number of Huffaz – e – Karaam that have always been studying in all the schools. 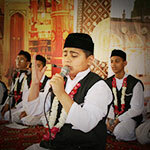 With the help of these young Huffaz – e – Karaam, it becomes very easy for other students to recite Quran – e – Sharif with Tajweed. The Metropolis Education System Curriculum (MESC) primarily focuses on the religious development of the students. 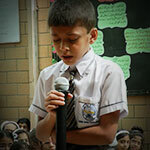 Being Muslims, the students are required to recite Quran – e – Sharif and offer Namaz daily. Any student showing negligence in offering these compulsory duties is not considered a part of Metropolis Community and he/she is asked to start performing the same without any exception. Annual Eid Milad – un – Nabi (SAW) celebration, Qirat competitions, Naat competitions, assembly presentations and celebration of the Holy month of Ramadan – ul – Mubarak are the other ends which fully target to familiarize the students in detail with their so loving religion.